Vladimir Putin hoped he would stick to its commitments on Syria. 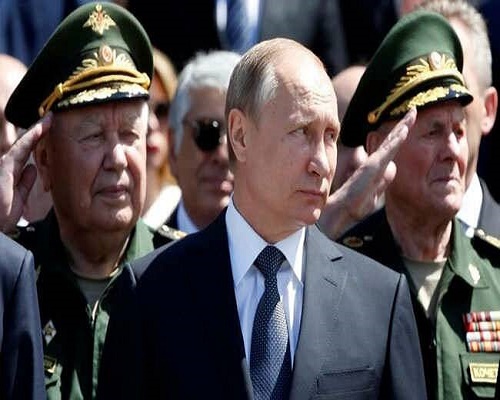 BISHKEK: Russian President Vladimir Putin said on Saturday he hoped the United States would stick to its commitments on Syria, adding that he believed securing a truce in that country’s conflict was the common goal of both Moscow and Washington. The United States and Russia said on Friday they wanted to extend the four-day-old ceasefire in Syria they have co-sponsored, although the agreement looks increasingly shaky, undermined by increasing violence and a failure to deliver aid. The two Cold War-era rivals also back opposing sides in the Syrian conflict, making cooperation difficult. Moscow supports President Bashar al-Assad, while Washington backs some rebel groups fighting to oust the Syrian leader. “Our partners (the United States) are calling for openness and transparency … but they are deviating from this postulate,” Putin told reporters during a visit to the Kyrgyz capital Bishkek for a summit of former Soviet republics. Nearly five million Syrians have fled the country and some 6.5 million have been internally displaced during the more than five-year conflict, contributing to the record 65.3 million people who were uprooted worldwide last year. Putin also commented on Saturday on November’s US presidential election, saying Moscow would support any person in any country who “is friendly to us”. The US Republican Party’s presidential nominee Donald Trump has spoken admiringly of Putin, spurring speculation about a possible thaw in currently still-frosty relations between Moscow and Washington if Trump wins the White House. Earlier on Saturday Kremlin aide Yuri Ushakov said Putin would attend a summit of the Asia-Pacific Economic Cooperation (APEC) in Peru in November, adding that US President Barack Obama was also expected to attend. Obama, who has had difficult relations with Putin, stands down in January.